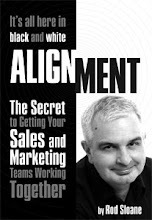 Sales and Marketing Alignment Blog from Rod Sloane: Why Should I Care? Back in the early 1970's I was just another spotty teenager. And like most kids I loved rock music. It was escape and fantasy, my favourite band in the early 70's were the Who. In 1973 they released a brilliant album “Quadrophenia” about a self obsessed 60's mod kid Jimmy. The classic song from that album is 5.15 about a train journey. Yes, a British Rail journey from Waterloo to Brighton. This song starts with Pete Townsend singing the line”Why should I care?” Now it was then introspective, but it is the line clients and prospects think all the time. in the words of Doug Hall unless you can show a Dramatic Difference. Clue. The answer is what you do for your market! look like very great article!